The Totems installation is part of a long-term project initiated by Ravi Naidoo of Design Indaba and was first introduced at the Design Indaba conference in February, 2018. Biodiversity on planet Earth is under momentous threat, with extinction rates estimated between 100 and 1,000 times their pre-human level. The Mediated Matter Group has been in search of materials and chemical substances that can sustain and enhance biodiversity across living systems, and which have thus far endured the perils of climate change. Melanin is one such substance, enabling biodiversity at the genetic, species and ecosystem levels. It is the ‘universal pigment,’ found in skin, hair and eyes as well as in feathers and butterfly wings. It has been found in fossils from some 160 million years ago, and today can be chemically synthesized with modern techniques. It represents unity in the diversity of life on earth. A biomarker of evolution, melanin is the color of life. The substance that defines the color of our skin is at once ancient and modern: melanin is found in fossils dating from the Mesozoic Era, and today can be chemically synthesized ex vivo with modern techniques. It is one of the most resistant, heterogeneous, and pervasive pigments found across the kingdoms of life. In addition to its critical role in providing protection from ultraviolet radiation, it has a wide variety of functions: mechanical protection, energy harvesting, cell growth, metal binding, thermal regulation, and protection from oxidative stress. It is the ‘universal pigment’ found in skin, fur, hair, and eyes. It is also found in the blue feathers of peacocks, the ochre wings of butterflies, and the brown skin of a ripening pear. Melanin’s value for human health is priceless. An intriguing vehicle for the exploration of human health and culture across regions and environments, melanin remains an identifying feature of all living organisms and is clearly linked to biological survival throughout the ages. Today, it is considered by some to be more valuable than gold, and its impact — in the age of climate change — is key to human survival on Earth. In an age where we can engineer melanin, who owns biological color? What are the biological and cultural implications of these capabilities? What are their promises and their perils? The installation investigates the long and crucial intersection between culture and nature by questioning the dichotomy between the societal and biological roles associated with designers’ abilities to engineer melanin’s expressions within and across species. Through this investigation, we question our ongoing relationship with biology and natural history. In preparation for this project, we studied the biosynthesis of melanin in the natural world and translated the processes into a set of chemical design protocols in our Lab. In the following experiments, melanin was created in three ways: chemical synthesis, extraction, and bacterial synthesis. Melanin can be synthesized through a reaction between an enzyme from a mushroom, called tyrosinase, and the protein building block L-tyrosine. The pigment can be extracted from bird feathers and cuttlefish ink, then purified and filtered in a series of steps. The genes for melanin production can also be engineered into bacterial species, such as Escherichia coli, and thereby controlled though recombinant gene circuits over space and time, and in response to changes in the environment. For instance, the coloration could deepen as the sun reaches its peak each day, providing protection from solar radiation. Over the past year we developed methods for the design of structures that can contain biological substances across scales (from micro to macro) and phases (solids and liquids). 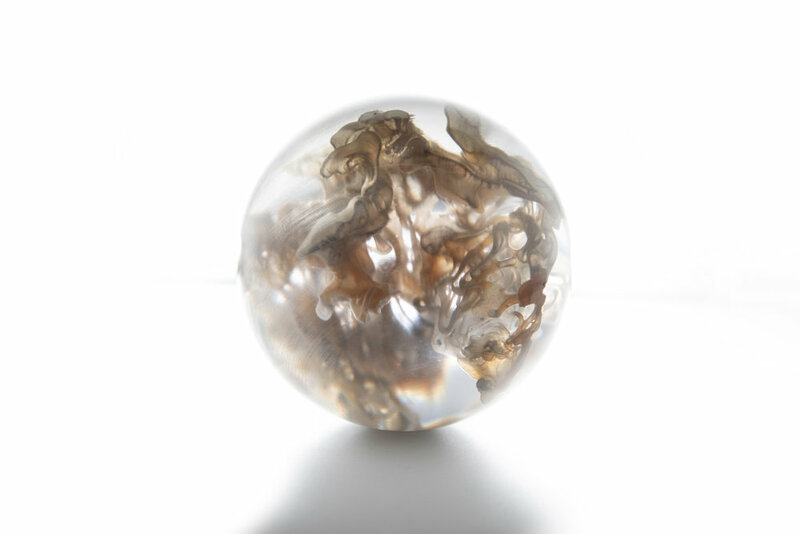 As part of the basic research behind Totems, we created a series of spherical objects featuring a single or multiple connected channel filled with liquid melanin. These ‘orbs’ display a wide range of colors and absorption spectra, from yellow to darker tones. The channels have been computationally ‘grown,’ additively manufactured, and biologically augmented to create pockets from millimeter to centimeter scale for enzymatic liquids to reside. Novel tools and techniques have been designed that utilize melanin-like biochemicals, melanin synthesized by engineered and wild-type bacteria, and melanin extracted from human hair. 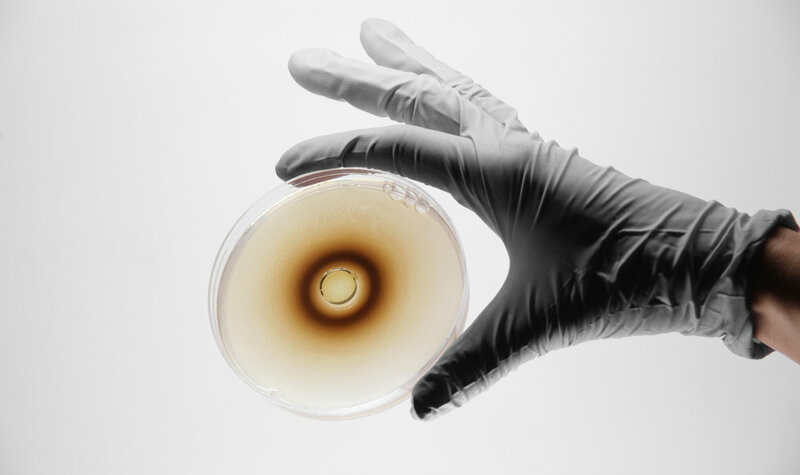 Our goal is to provide insight into this common yet extraordinary pigment and to shed light on its role for supporting life on Earth in the age of synthetic biology. The installation designed for “Broken Nature” features a demonstration of melanin production on an architectural scale for deployment in specific environmental contexts. It is comprised of a totem—a spirit being, sacred object, or symbol that serves as an emblem of the Tree of Life. 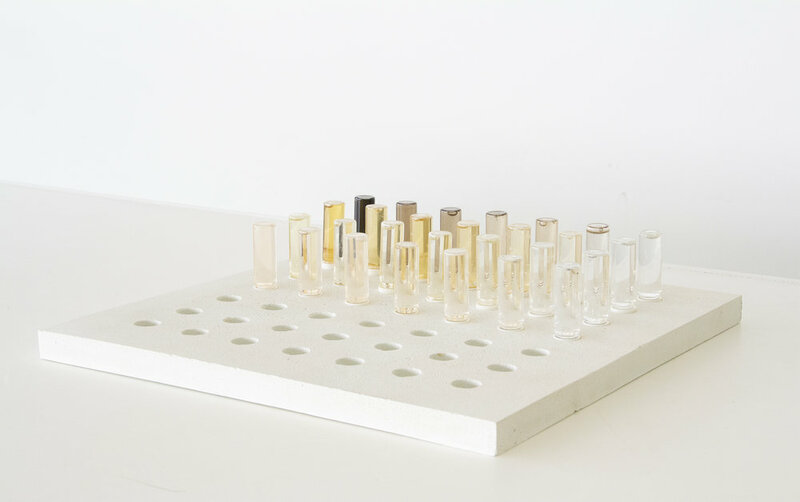 Illustrating a product that embodies a process for melanin formation, the research at the core of this work fuses digital fabrication and design computation with chemical reaction dynamics, resulting in a ‘chemical Totem.’ Each structural embodiment ― a biological totem ― is initiated with the introduction of tyrosinase, an enzyme that leads to color formation that continues over the span of a day, deepening as the sun reaches its zenith. In this way, the demonstration is a ‘window’ that provides protection from, connection to, and transformation of sunlight. Included in the project is an architectural proposal for an environmentally responsive melanin-infused glass structure. It is designed to contain multiple types of melanin including the replication of natural melanogenic process observed on site and biological synthesis or extraction processes performed at the Lab. A first-of-its-kind biologically augmented façade, the structure is designed to mirror and protect endangered species on site and to celebrate the diversity of life on our planet. The architectural proposal is part of a long-term project initiated by Ravi Naidoo of Interactive Africa and was first introduced by Neri Oxman and The Mediated Matter Group at Design Indaba, 2018. Sunanda Sharma, Christoph Bader, Rachel Soo Hoo Smith, Felix Kraemer, João Costa, Joseph Kennedy, Joseph Faraguna, Hans Martin Pech, Susan Williams, Natalia Casas, Prof. Neri Oxman. The installation is part of a long-term project initiated by Ravi Naidoo of Design Indaba and was first introduced at the Design Indaba conference by Neri Oxman in February, 2018. Totems is dedicated to all sentient beings across the six kingdoms of life—past, present and future.